Get ready to revoke my green card because I’m going to say something pretty darn unpatriotic. Apple pie is easily my least favorite dessert. To the point that I’d rather not have any dessert if that’s the only offering. Flaccid apples enveloped with raisin-studded goo flavored with cinnamon is about the most unappealing pie filling I can imagine. 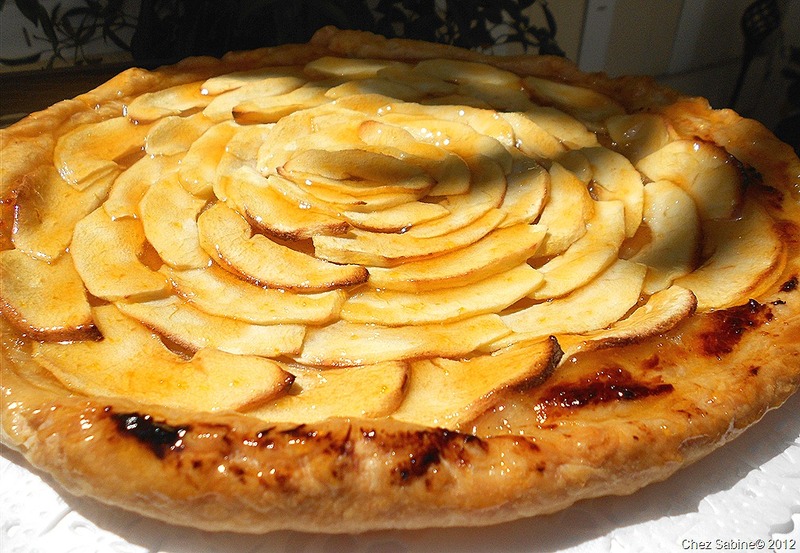 Having said that, one of my favorite flavors is that of a French apple tart. The difference being exactly what? — you ask yourself. Bite into a French apple tart and your taste buds are immediately met with the friendly smack of sweet butter, quickly followed by the slightly sweet flavor of just-picked apples. That’s pretty much who’s at the flavor party. Fruit and butter. That’s a combination that’s nearly impossible to argue with. And throw in the fact that it’s foolproof and ridiculously easy to prepare. And did I fail to mention that it looks as if you picked it up at the local patisserie? Well, it does. I cannot wait to try this. I love tarts! Laura, it’s so easy. Make it and tell me what you think. And thank you! Yikes! Now, that could be interesting. But, I vote no. The tart is pretty fabulous without bacon. I know it’s hard to believe that bacon can’t up the flavor ante. This was so much fun to make. Was a little surprised at the cost of that puff pastry. I think I will use less apples next time in hopes to taste more of that delicious pastry. Thank Sabine. I am so glad to be following your blog. I’m so glad you made the tart, Kim. Yes, that puff pastry is silly, price-wise. Wait until Trader Joe’s starts selling its puff pastry, then snap some up to store in the freezer. It’ll last a good long while. And it shouldn’t be much more than $4 or $5 for two sheets. You can use the same amount of apples, but you want them to be really thin, that way they shrink up a bit and won’t overshadow the fabulous buttery flavor of the pastry. Thanks for reading!